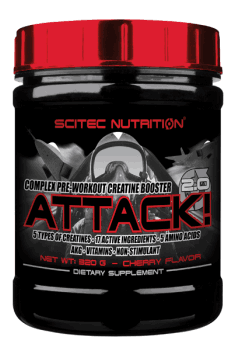 Scitec Attack 2.0 is an effective pre-workout preparation containing creatine blend, which consists of a regular monohydrate and its micronized form, creatine anhydrous, as well as pyruvate and creatine citrate. In addition, the product contains L-glutamine, taurine, L-tyrosine, L-ornithine hydrochloride, L-arginine hydrochloride, citric acid, malic acid, calcium alpha-ketoglutarate and the addition of vitamin B3 and folic acid. The increase in the total amount of phosphocreatine in muscle tissue through the ingestion of creatine may provide an ergogenic effect. Creatine intake increases the endogenous production of phosphocreatine (PCr), the stores of which can accelerate ATP resynthesis during maximum efforts of 5 to 10 seconds. The production of anaerobic peak power and anaerobic performance during high-intensity short-term exercise is therefore dependent on endogenous levels of ATP and PCr. The product comprises of 5 different forms of creatine, including the monohydrate and its micronized form – creatine anhydrous, which in comparison with other forms has a better absorption in the body. In addition, the preparation also contains creatine pyruvate and citrate. Both compounds participate in the production of energy in the body and thus increase the potency of the preparation. L-glutamine is the most abundant amino acid in the body, which during the increased metabolic demand has a positive effect on the human body. One of such periods may be physical stress caused by regularly undertaken intense effort. Glutamine supports the proper functioning of the immune system preventing the weakening of immunity, and thus allows the continuation of the training cycle. In addition, it ensures the integrity of the intestinal barrier in the gastrointestinal tract, facilitating the correct use and absorption of nutrients and reducing the amount of toxins that pass through the intestine. The preparation was enriched with taurine, L-tyrosine and L-ornithine hydrochloride. In skeletal muscle, taurine is involved in stimulation and contraction processes, and it contributes to the regulation of cell volume and supports antioxidant protection. L-tyrosine is used as a psychostimulant that reduces fatigue and increases exercise capacity. Intensive physical activity causes the accumulation of ammonia in the body, thus contributing to muscle fatigue and weakening of cognitive skills. L-ornithine hydrochloride participates in the urea cycle favoring the excretion of ammonia from the body, and thus reducing its negative effects. L-arginine hydrochloride contained in the product is a precursor to nitric oxide (NO). According to the available data, this form of arginine is better digestible and shows a longer duration of action. Increased synthesis of nitric oxide causes relaxation of the smooth muscle of the blood vessels, and thus allows increased blood flow through the muscles being trained. Improved blood flow to working muscles affects their better supply with oxygen and nutrients, and thus enables them to work more efficiently. The Krebs cycle is the basis of aerobic respiration, enabling the release of energy contained in food components. The preparation contains substances involved in this cycle and its substrates, including citric acid, malic acid and calcium alpha-ketoglutarate (AKG). Their addition improves the Krebs cycle, and thus the more efficient production of ATP, which is a source of energy necessary for all life processes, including those related to physical effort. Vitamin B3 (niacin) is involved in energy metabolism and has a positive effect on the nervous system and mental health. Folic acid supplementation may reduce chronic fatigue and affect the proper functioning of all body cells. Deficiency of folic acid may lead to megaloblastic anemia, the occurrence of which significantly limits the exercise capacity of the body. In conclusion, Scitec Attack 2.0 is a pre- and post- workout preparation that increases the exercise capacity of people undertaking physical activity. Consumed before training, the supplement will support both advanced athletes, contributing to improving their results, as well as individuals practicing for pleasure, giving them great results. Dobry produkt w skali 5 mogę z czystym sumieniem dać 4 ( wiadomo na kazdego inaczej to oddziaływuje ) .. Pompa 4/5 , smak 4/5 , skupienie 5/5 no i wytrzymałość 4/5 ;) Warto spróbować . Take one portion 30 minutes before training and one portion immediately after training. Take one portion in the morning on an empty stomach and one portion before the main meal. The second portion on non-workout days may be skipped by people with low body mass and beginners. Advanced sportsmen should take two portions each day. Using for at least 8 weeks will ensure best effects. Cherry: Flavor (Cherry), Citric Acid Anhydrous, Anti-caking Agent (Tricalcium Phosphate), Sweeteners (Acesulfame K, Sucralose), Color (Carmoisine**). Pink lemon: Citric Acid Anhydrous, Flavor (Pink Lemonade), Sweeteners (Acesulfame K, Sucralose), Anti-caking Agent (Tricalcium Phosphate), Color (Beetroot Red). Pear: Flavor (Pear), Citric Acid Anhydrous, Sweeteners (Acesulfame K, Sucralose), Anti-caking Agent (Tricalcium Phosphate).